Welcome to your *Home Away From Home. * Unlike traditional motels, ours offers you warm, cozy, and comfortable accommodations. Our friendly and courteous staff will make your stay with us a great experience. 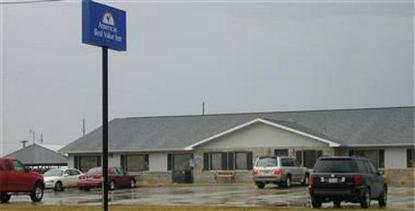 Our small town motel is centrally located within easy driving distance of several large cities. Come and experience all the amenities of our quaint little town. You can golf, fish, hunt, and shop. If the larger cities are calling you, hop in your car for the one hour drive to Kirksville, Moberly or Columbia where you can catch some good racing, visit the malls, or attend college games. Quincy, Illinois is also nearby. You can visit the boyhood home of Mark Twain in Hannibal, MO, just a short 45 minute drive away. No matter where your days take you, your nights will bring you back Home to us. Our front desk is staffed 24 hours, so we are always ready and willing to assist you. Choose from one of several themed rooms including cats, dogs, Harley Davidson, hunting and tractors. Enjoy taking a step back in time as you browse our hallways, where you can view treasured photos of our town and its citizens from years gone by. Our guest rooms offer you many comforts of home including microwave, refrigerator, desk and chair. Choose from single queen, double queen, smoking, non-smoking, and handicap rooms. All handicap rooms are adjoined to another room for your ease and convenience. Work or play with our guest computer or bring your own lap-top and enjoy our wireless Internet connection throughout the entire property. Guest vending and laundry machines are also available for your convenience. Come stay with us, give us a try, we are certain you will be very satisfied. Discover the value of staying with Americas Best Value Inn .